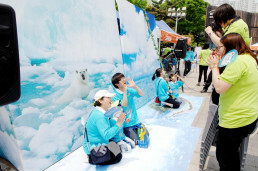 On May 13, Chairwoman Zahng Gil-jah introduced the situation of the island country that is gradually disappearing on the Earth, being submerged due to sea-level rise, to the 14th New Life Family Walkathon participants who gathered at the Pyeonghwa Square of the Olympic Park; her voice became choked with sadness. Her opening address in choking and sad voice was a soft rebuke and earnest appeal that enlightened the indifference of all people who had corporate responsibility as global neighbors. Tuvalu is destined to disappear from the Earth first among the countries, of which the sea-levels rise and territories become narrow under the influence of global warming. In Tuvalu, the highest altitude above sea level is just four meters [13 ft]. Most of the territory are islands made of coral reef, and the inhabitants have been living, relying on rainwater. Recently, however, they are even suffering from a drinking water shortage due to drought. The territory gets narrower because of surging seawater and increasing trash piles. What was worse, the neighboring countries reject their immigration or demand difficult conditions. The indifference of the global neighbors makes them feel more sorrowful. Chairwoman Zahng Gil-jah encourages and asks the members to have interest in climate refugees. The entire armed forces Honor Guard Drill Team, and the military band of the Korean Ministry of National Defense supported this event through restrained and wonderful demonstration and vigorous and rhythmical music performance, and received a standing ovation. The combined Honor Guard Drill Team from the army, the navy, the air force and the marine corps is in charge of national events such as a visit of the head of a state. 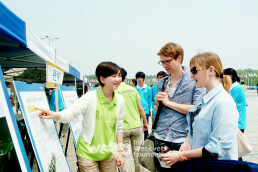 And also the team regularly gives a demonstration for citizens in the War Memorial of Korea, Cheongwadae and so on. The commander of the Honor Guard Drill Team said, “Just as you give happiness, joy and hope to others through volunteer activities, we are also proud of presenting such joy to our citizens. The purpose of today’s event is very good, and it is also good at the national level,” and added that it was rewarding to participate in the meaningful event that delivered hope to global neighbors. As the pre-event ceremony, the performances of the New Life Children’s Choir, and the demonstration of the Ministry of National Defense Honor Guard Drill Team were spread. After that, the videos about climate refugees and the WeLoveU members’ activities were played. 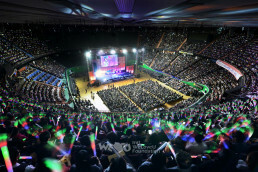 Around 11 a.m., the opening ceremony started with video congratulatory messages of important figures overseas. Anote Tong the President of Kiribati, which is in danger of being submerged along with Tuvalu, congratulated on the event, saying, “Though the sea-level rise due to climate change is serious, most people do not yet recognize the fact.” World Bank Vice President Rachel Kyte and the UN Environment Programme Spokesperson Nick Nuttall said that it was great and wonderful that Korea held a walkathon to help climate refugees. 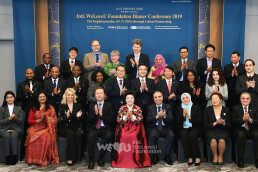 After the welcome address of Chairwoman Zahng Gil-jah who urged people to have interest in Tuvalu, greetings of Sponsor Chairman Lee Sun-jae, Ghanaian Ambassador Margaret Clarke-Kwesie, and the Executive Director of Netherlands Foreign Investment Agency in Korea Hary van Woerden were followed. Lastly, Director Gwon Hyeok-jin read out the declaration to help climate refugees, which closed the first part of the event. 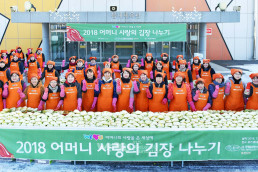 According to the start declaration of Chairwoman Zahng Gil-jah, members stepped to help climate refugees around the world. 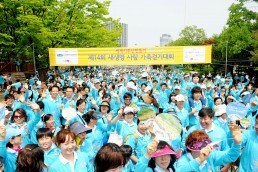 In the 2.5- kilometer-walking section, the members with blue shirt formed blue waves. The posters set on the way reminded the participants of the matters of the environment and climate refugees through the subjects, “Do not ride but walk,” “Shout out loud 26°C [78.8°F] (optimal indoor temperature in summer),” “Pull the plug out,” and “We love Tuvalu.” Many families walked, talking about the environmental problems sincerely. As subordinate events, the photo exhibition that informs the difficulty of Tuvalu and the “Coin Bank of Hope” collection corner were prepared. 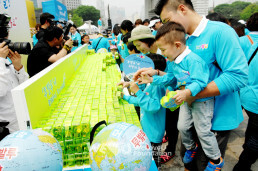 The 12 corners such as Climate Refugee Experience, Climate Refugee PR and Eco Experience to inspire the awareness about the environmental problems and to seek the specific ways to cope with climate change were prepared. 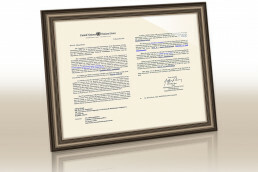 Members said, “As we came to know about Tuvalu, we became alert to the environmental problems. Since climate change is applicable to all people of the Earth, we think that all of us should participate in the environmental protection with one mind.” And they said that the problem of Tuvalu is not “another’s affair” but “mine” and “ours.” The notes densely stuck on the board for the messages of hope, and heart-shaped coin banks piled in front of the stage contained the warmhearted sincerity of the members who wanted to help Tuvalu refugees. According to the Bible, rainbow is the sign of God’s promise that He will never again destroy the world with waters since Noah’s Flood. It was once broadcast in Korea that Tuvaluans who have a strong faith in God were praying, remembering the promise of God and believing that God would never destroy them with waters but protect them. If all of us stretch out our hands and have interest in them without looking away from the pain of our neighbors, a new rainbow of hope will rise for human beings.